It was 1992. Ken and Deb were newlyweds, living in a farmhouse outside the little town of Kittitas while attending graduate school in Ellensburg. No indoor pets, said the landlord. There were plenty of animals around–a horse in a corral that we could watch while eating at our dining table. Sometimes the horse was joined by a few cows. There were chickens, and a flock of ducks that cruised around quacking. A couple of geese, half domestic and half wild. I’ve never been afraid of animals, but these birds were intimidating. And barn cats. One of them was an irascible long-haired gray male named Hector. He had once lived inside, but was turned loose to fend for himself. I started feeding him on the porch, and eventually he allowed me to pet him. He could only stand it so long, and then he would whip around with his claws. Like I said, irascible. There was another cat, a mama barn cat. She had litters regularly, but things happened to cats out in the country. We tried raising a couple of kittens outside, but as soon as they started growing up, they wandered out onto the road and didn’t know to get out of the way of speeding vehicles. We gave up after two cat funerals. The mama cat had two daughters. One was shy and one was brazen. The brazen one went into her first heat and predictably had kittens soon after. They were hidden in a lumber pile out by the corral. We tried to see them, but they were wild and ducked into hiding as soon as we approached. Before they were weaned, Brazen wandered out onto the road one night, and we found her still body on the pavement the next morning. We worried about the kittens when we heard them mewing desperately from the depths of the lumber pile. In the meantime, another barnyard drama was unfolding in the chicken house. Skunks were getting in and slaughtering chickens in nightly bloodbaths. There was one chicken with deformed feet. Her toes curled under, and she walked with difficulty. The others pecked her, so she adapted. She learned to fly, and roosted in our woodshed at night. We called her Miss Chicken. One day I observed Miss Chicken patrolling the yard as she often did. A tiny striped kitten with white paws was following her around. When the chicken caught a bug in her beak, the kitten looked for bugs too. He was the sole survivor. I am my grandmother’s granddaughter, so an orphaned animal sets me in motion. When I was growing up, Gramma routinely bottle fed calves. She raised an orphaned fawn after its mother was hit by a car. I remember a lamb running up and down the hall in the house. There were cats and dogs, rabbits, peacocks, guinea fowl, chickens, ducks, and quail. We are a family of people who bond with animals. Since I was already feeding Hector, why not feed another cat? I was determined to tame this wild kitten. Over the course of a few days I put food by the lumber pile and gradually moved it closer to the porch. Soon the kitten was eating at his own bowl. Hector was dominant, and had to be fed first. The little guy waited until it was safe to eat. It was a long time before I was able to touch the kitten. Mine was the first human hand to reach to him, and as soon as my fingers contacted his knobby little spine, the tail went up. That was it. He purred. He was our Kitten. He roosted in the woodshed with Miss Chicken at night, and followed her during the day. Sometimes we snuck him in the house so he would know about inside. He came to be known as Hibachi, which means “small warmer” in Japanese. When we moved from that house, Hibachi moved with us. The next landlord allowed indoor pets. Hibachi learned to go in and out–the house was further from the road. He frequently brought us voles he had caught, and preyed on birds as in spite of our discouragement of that. Sometimes he was a catch and release hunter, which made things lively in the house once in awhile. One of his proudest moments was when he stalked the pheasants that ate at our bird feeder. They flushed into flight, the cat leaped, and one paw counted coup on the long tail feathers. Hibachi was a member of our family. When he was about three years old, the family grew. A springer spaniel puppy appeared and stayed. The cat’s nose was seriously out of joint over this. It took some time, but the dog and cat learned to play together and we were eventually forgiven. The trauma of being orphaned stayed with him. He could be clingy and demanding, especially when we moved again and he was not permitted outside without a chaperone. Loud noises and sudden movements were overwhelming, and he had to hide. Certain people were too noisy and boisterous. He did not care for children. I had one art student, Joel, who was able to make friends with Hibachi after his voice changed and deepened. Something about high squeaky voices made him run. Other people, however, were cat magnets. He would remember friends who hadn’t visited in awhile, and climb onto their laps to curl up contentedly. The next puppy was too much. An energetic Labrador, Sam never learned to stop chasing cats. In addition, the neighbors had a very territorial female cat who came into our yard and terrorized Hibachi. We heard cat fights. Our guy grew furtive and spent more time in the house, sneaking out when he felt safe enough. My upstairs art studio was a favorite hangout. When Ken and I split after 14 years, I asked for Hibachi. The answer was no. After a year of moping, I was thinking about adopting a shelter cat. My friend Mikki grew tired of my indecision and brought me the kitten I named Henry. Soon after that, Ken called. He had gotten another dog, and it was not going well for Hibachi. So he came to live with me and Henry. The two cats were never friends, although there came to be truces. Henry is supremely confident, large and jealous. Bachi was downtrodden and scared. For a year or two, he ran to hide under the clawfoot tub whenever anyone came in the house. He rarely went outside, but eventually learned to use the pet door to snoop around the yard. Slowly he became more sociable, coming to see who was visiting. He had his favorites, among them John, Jon, and Margy. These past few years, we have been living with chronic kidney failure. When the end comes, the vet told me, it will come fast. Bachi slowed down, became more a creature of habit. He always let me know when it was suppertime and bedtime. I wondered if there is such a thing as kitty dementia–if he couldn’t see me, he would set up a loud querulous meowing until I appeared to reassure him. We had our routine of lap time when I do my morning journal-writing and tea-drinking. The bedtime routine of him lying on my legs above the knees. That was his spot. The last few months, he snuggled under the quilt with me. This winter he spent more time sleeping in front of the stove. It became difficult for him to walk. He was drinking more water. He lost weight, became frail. When the end came, it was fast. I had been wondering when it would come, and had made up my mind to let it be as natural and stress-free for him as possible. What would I do when he couldn’t jump on the couch any more? What would I do when he couldn’t walk at all? What if he just went to sleep and didn’t wake up? I worried. About a week and a half ago, the decline sped up. I looked into his eyes, and saw the spark of life dwindling. Not long now. His friends came to see him–to pet him, hold him, and speak gentle words. I held him more, and as I did, memories came flooding back. Twenty years of feline companionship is a long time. I wanted him to know as much love as possible in the time he had left, and a miracle happened. He stopped being afraid. The vacuum had always terrified him, but during the last week he just observed it. Nothing bothered him, not even Henry. When he stopped eating and purring, I had to act. Maybe he could stand the slow dwindling, but I could not. With tears, I made the appointment. That last night he slept on my chest, as light as a feather and completely relaxed. To be present at the death of a loved one is a profound experience. Hibachi was ready to go, and had somehow held on until I was ready too. He was calm on the ride to the vet, calm while waiting. In truth, he had already slipped away as much as he could without his heart stopping. As soon as the anesthetic hit his vein, I felt the weight of his head sag into my hand and he was gone. More tears then, as I wrapped him in a piece of sheet from our bed in that first house, where he was born. Jon and John helped me bring him home, and we buried him in a quiet spot in the garden under a cairn of stones. Every morning, I step out into the spring bird song to lay one flower on the cairn. When I come into the house, I expect to see him curled on the couch. Or feel his paws on my leg, asking to come up. There is an empty space in me, and I’m in no hurry to fill it. Animals teach us to be human. They teach us to love in spite of the end that comes to us all. They find their way into our hearts and spirits and make us a little more whole. Life goes on as spring comes. Life is sweet. And life is made ever sweeter by the companions who walk the path with us, on two legs or four. That is nice. I teared up a bit. I’ve been waiting… were I there, I’d like to hug you a bit. I know how hard it is to let a pet, as well as any human, go, but there comes a time in our lives that we must. 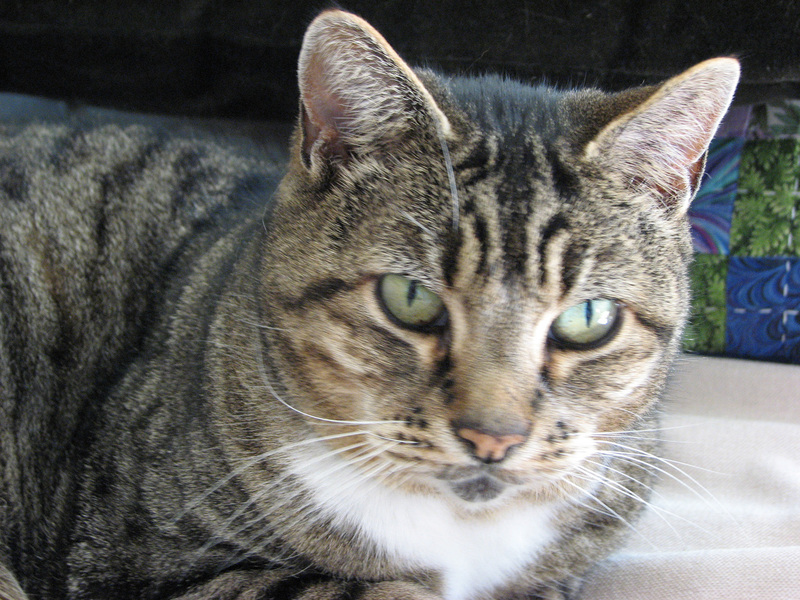 Hibachi was a wonderful cat who was loved by all the family who knew him. He will be missed but life does go on for the rest of us. Rest in peace old friend.